The day is here – day 1 of the Nordstrom Anniversary Sale! This day seriously feels like Christmas for us lol, and we actually get a lot of our Christmas shopping done during the sale. If you’re unfamiliar with the NSALE, this is not a regular sale…these pieces are new for fall 2018 and only on sale for a limited time (the prices go back to regular price early August and stay that way all fall!). The good stuff always sells out super quickly, and once it’s finally restocked, the sale is over and it’s back to full price! 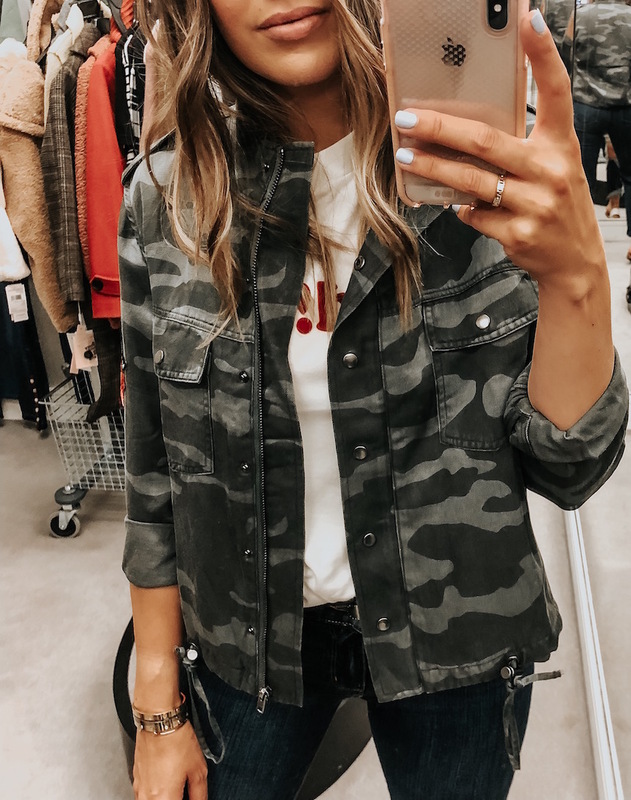 So, we never wait to pull the trigger on any item we are loving – especially since Nordstrom has FREE SHIPPING + FREE RETURNS! We’ve already placed our first order, but wanted to quickly share some of my favorites from the fitting room (along with sizing) with you! 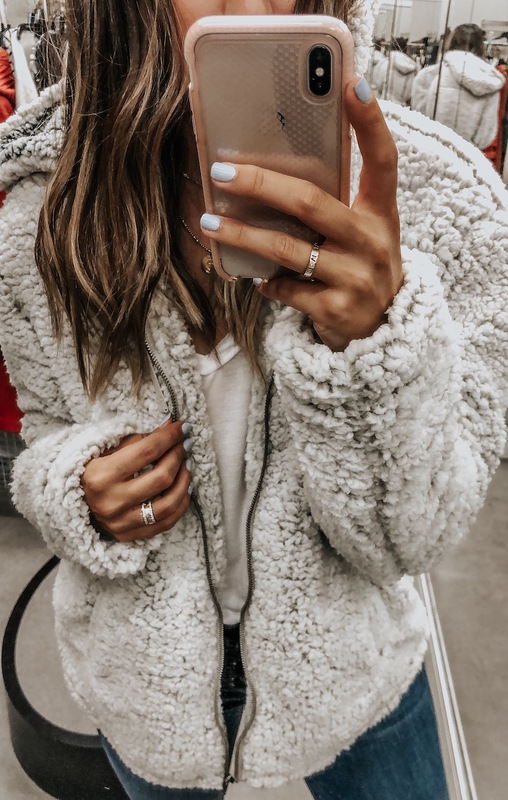 This fuzzy jacket is definitely going to sell out! It wasn’t even part of the anniversary sale last year and it sold out before I could get my hands on it! I bought this in a size small. It’s soooo cozy, you’re going to live in this! I’m also going to have to snag the pullover just because I know I will wear these jackets all.the.time! This is the perfect tee, and it’s on sale for $12! Yes, $12! I’m ordering 2 black, 2 white, one brown, and one stripe. It’s that good! So soft, easy to tuck or tie in a knot. I’m wearing a medium in this pic, but a small was fine too! 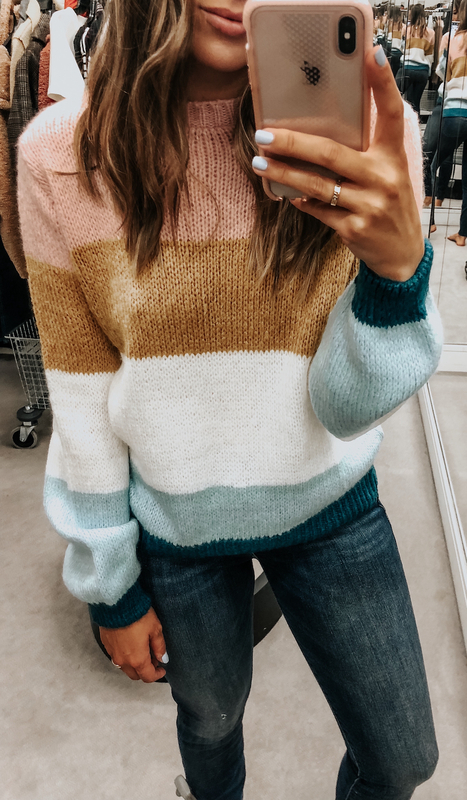 This is the cutest sweater ever! I think this one is definitely going to sell out! It runs small, I’m in a size 8. 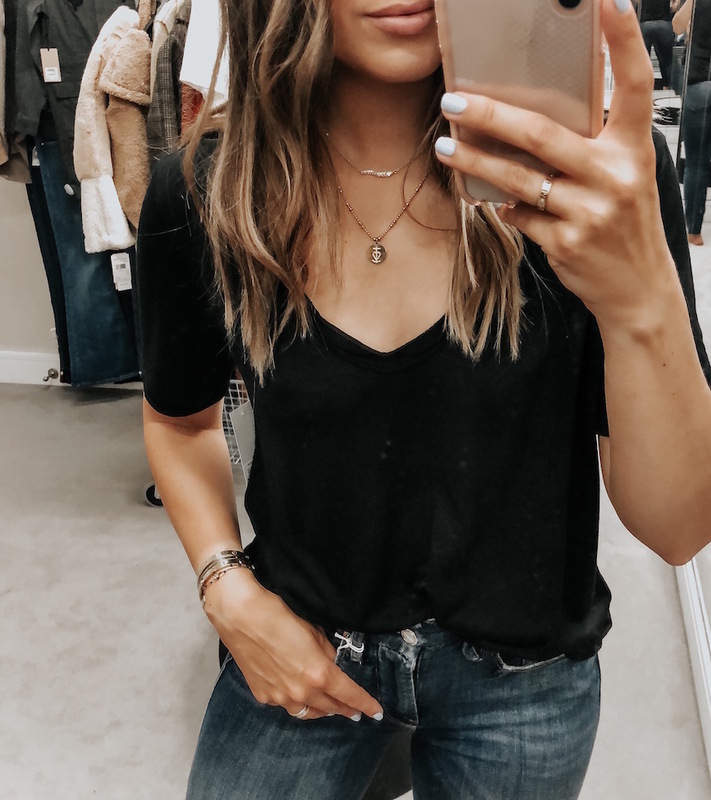 This is the first pair of Good American jeans I’ve tried on and I love them! They run big – I’m a 26 and got these in a 0. So comfy and a great price! These always sell out! 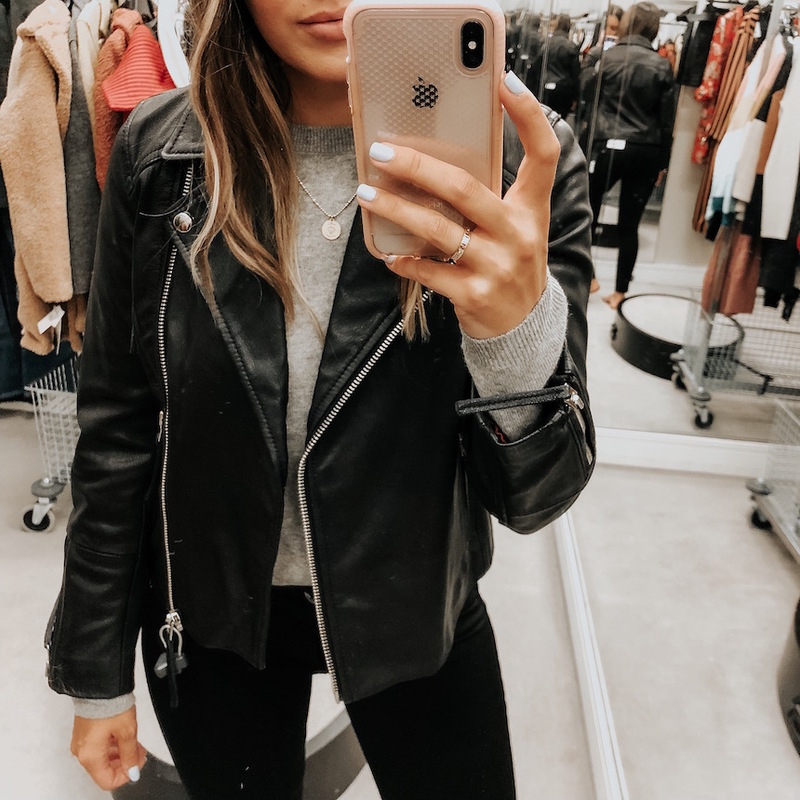 Budget-friendly moto jacket perfection! This is definitely going to sell out, it looks so expensive but is under $60! Also, very into this one with a hood! 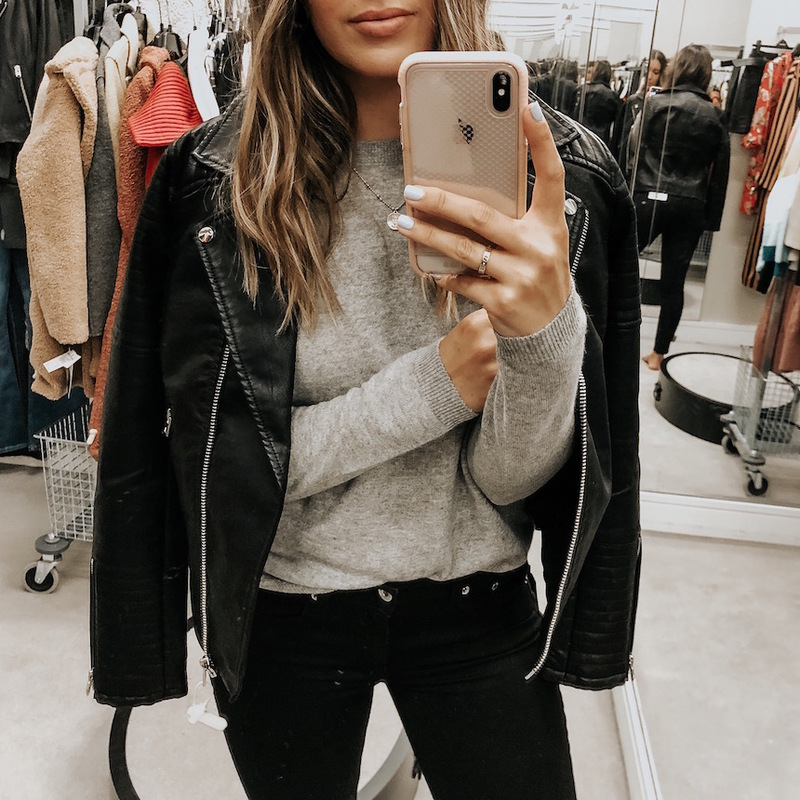 If you want real leather, this one is a great price and feels so soo similar one from IRO (for wayy less!). I’m wearing a 4, but would do a 2. 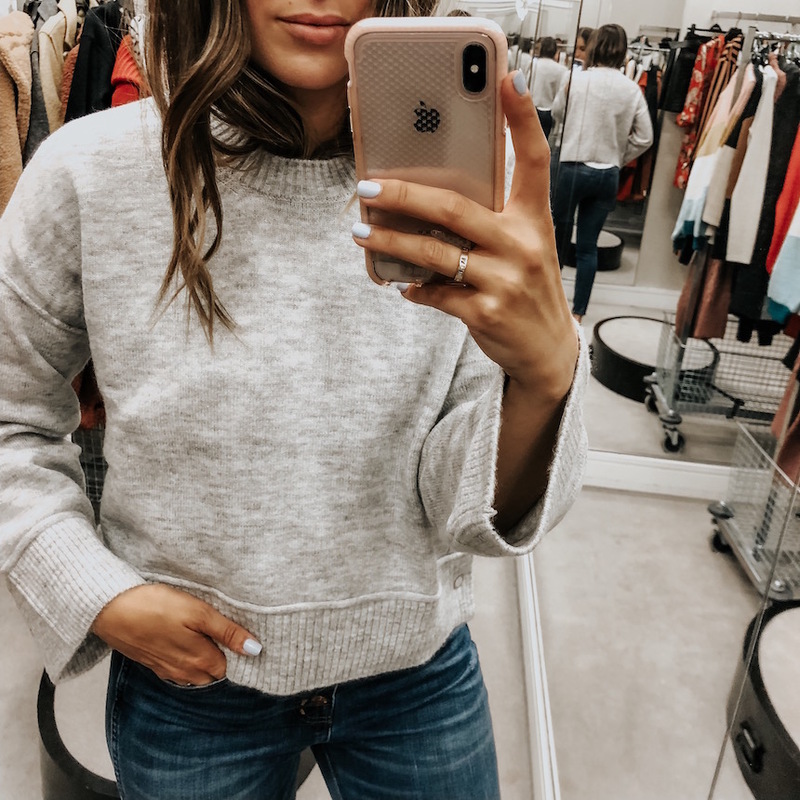 I love to buy staple pieces during the sale like this cashmere sweater – it’s a great price, and will last forever. I am wearing the XS, but after seeing the model, I’m going to go for a medium b/c I like the more oversized look. 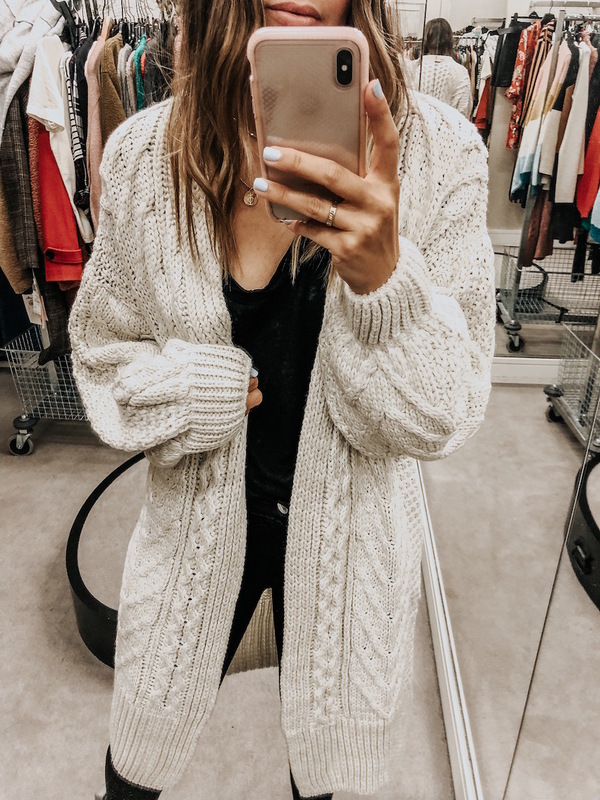 This chunky knit cardigan reminds me of one I was lusting after in March (for $500), but this one is on sale for $49! I’m buying all 3 colors! I’m wearing a size 2. 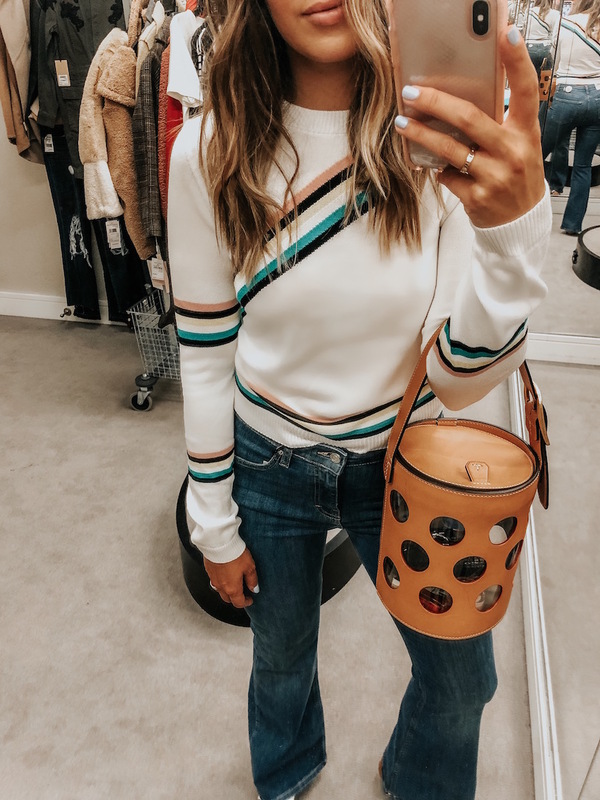 Love this rainbow sweater and these flares! The sweater runs SO small, I’m wearing a size 8, and the jeans are a 28 (I’m normally a 26). This sweatshirt is giving me all the Gucci vibes for a lot less ;). This coat is such a classic, I love the gray and the mustard. I’m buying the gray one in a size 2. 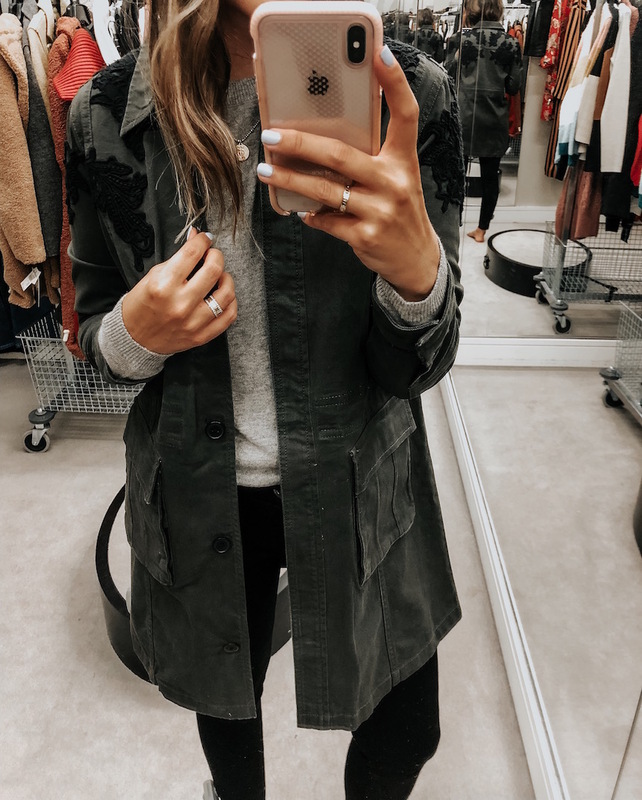 Perfect fall coat that will go with every outfit! I also love this gray one from Pendelton – this one is lined. Both are so pretty! 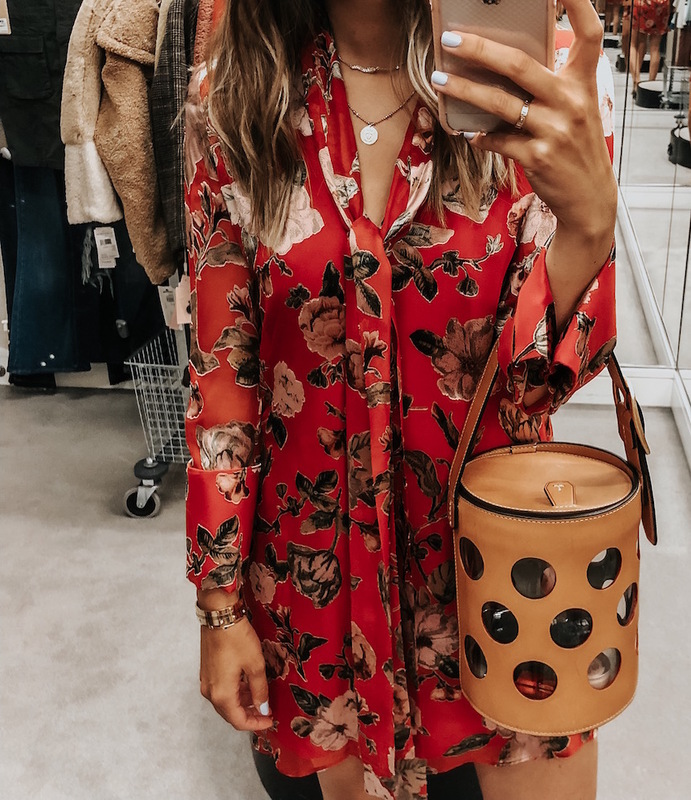 This dress is so pretty – perfect for summer, and so easy to transition to fall – throw on a pair of loafers or booties, a leather jacket and you’re good to go! I’m wearing a size small. Another dress I’m buying (but my store didn’t have) is this one in black. I’m getting a small. If you’re looking for a good pair of black jeans these are it, and such a great deal for designer denim! They do stretch, so I would say they run true to size (may be a little tight when you first put them on, but the girl told me not to size up). Shirt is linked two pics down! I love this sweater (size small) paired with the faux leather skirt (wearing a size 6) – would be perfect with OTK boots like these. Rails makes the best plaid shirts hands-down. The fabric is so soft and drapes so nicely! So many ways to wear these button-front shirts! I’m wearing a small. I already have this cardigan in another color from last year, but this blush one is soooo pretty! The material is so nice, it’s stretchy and so soft! I’m wearing xs. These jeans are so comfortable, but go down one size, and here’s the perfect tee again! 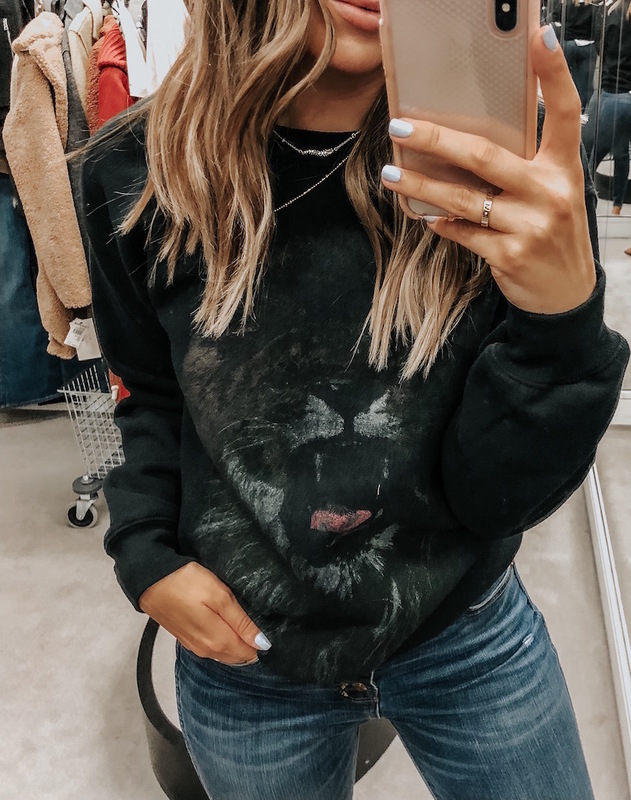 This sweater is $29, comes in 4 colors and so soft! I’m wearing the XS – it’s oversized. My cardigan was brought back this year – yay! Just in a darker gray. This sold our 3 times last year, so if you want it, get it now! I love the updated version of this cardigan (my store didn’t have the new one to try on). This sold out so quickly last year, and I guarantee it will again this year! It’s cashmere, mine still looks brand new, and I wore it allll the time! I’m getting this year’s version in gray and tan in the size xs/s, it runs big! In love with this 70’s inspired jumpsuit! The colors are so good, photos can’t do it justice. I’m in a size 4, but could go to the 6 to have a bit more room in the booty. 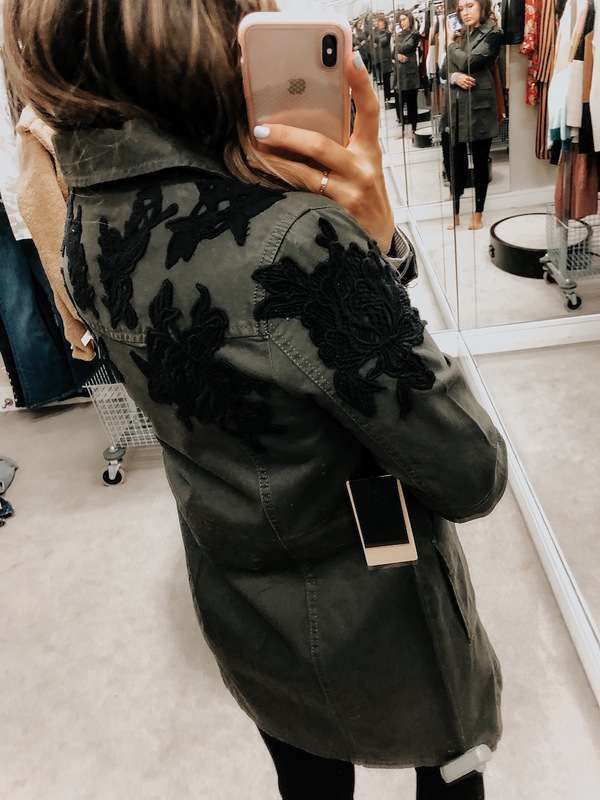 I almost didn’t try this jacket on, but I’m so glad I did! It is SO cute, I’m wearing the XS. It looks so much like my Veronica Beard jacket (which is why I almost passed it up). Love. I love these Veronica Beard jeans – the buttons on the side are so fun as well as the statement button fly. Wear them with heels, sneakers, and booties – so versatile! True to size. 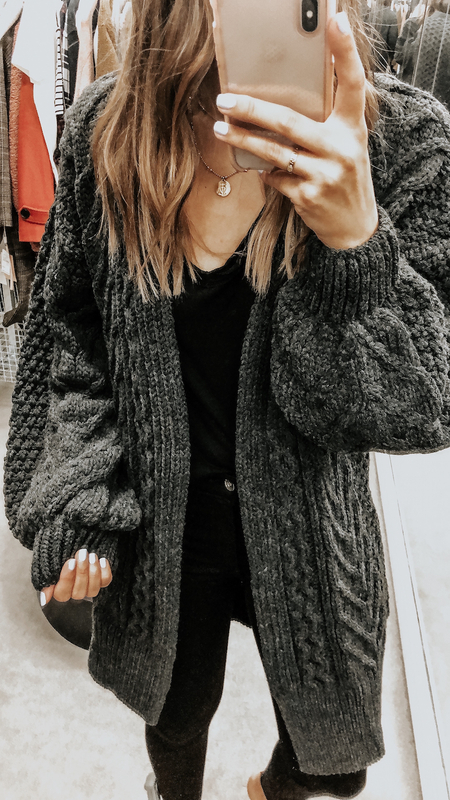 Coziest thermal under $30! Comes in 4 colors, I’m wearing a small. Also love this one – such cute details! 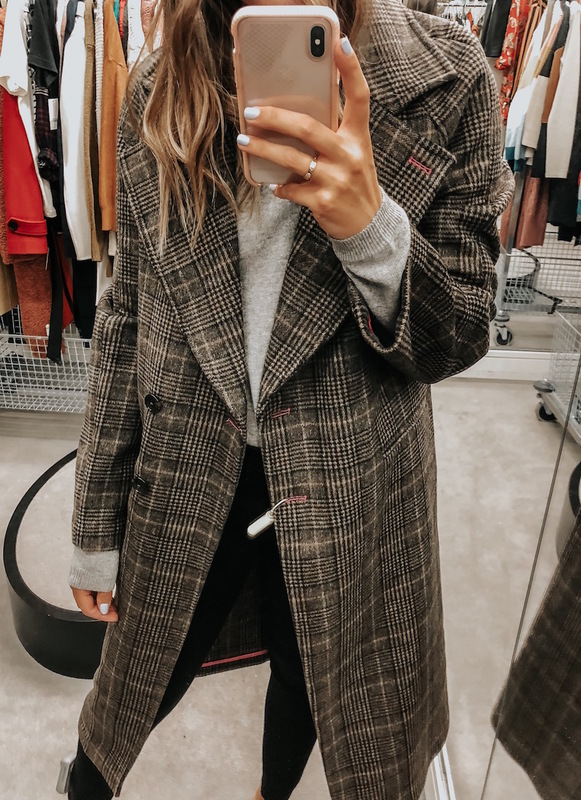 I love this oversized plaid coat – it is so soft, and I personally loved the oversized fit. Although this one is a splurge, I’m ordering it as well because I want to compare the two before I decide which one to keep. I don’t mind splurging on coats because I keep them for sooo long (literally still wear coats from 8 years ago). I’m also lusting after this one from Rag & Bone. Also…just going to leave this Theory cashmere coat here…OMG so good and the price is actually amazing for a cashmere coat! Which one should I order?! 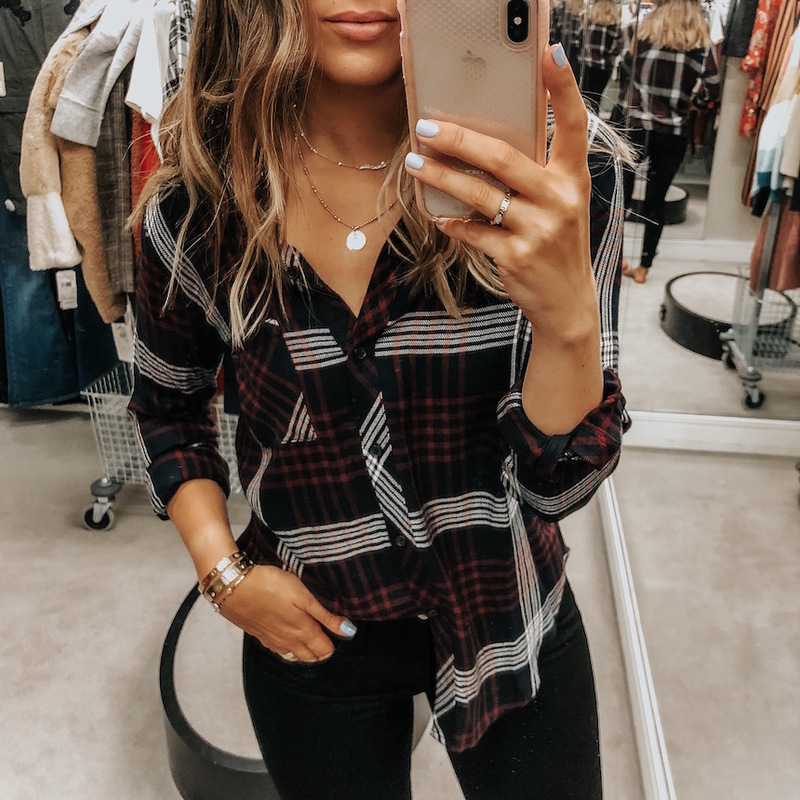 Okay, I just stumbled upon another plaid one I love and the price is amazing (under $100!)! Think I might scratch all the plaid options and go with this one! I love the double-breasted look! 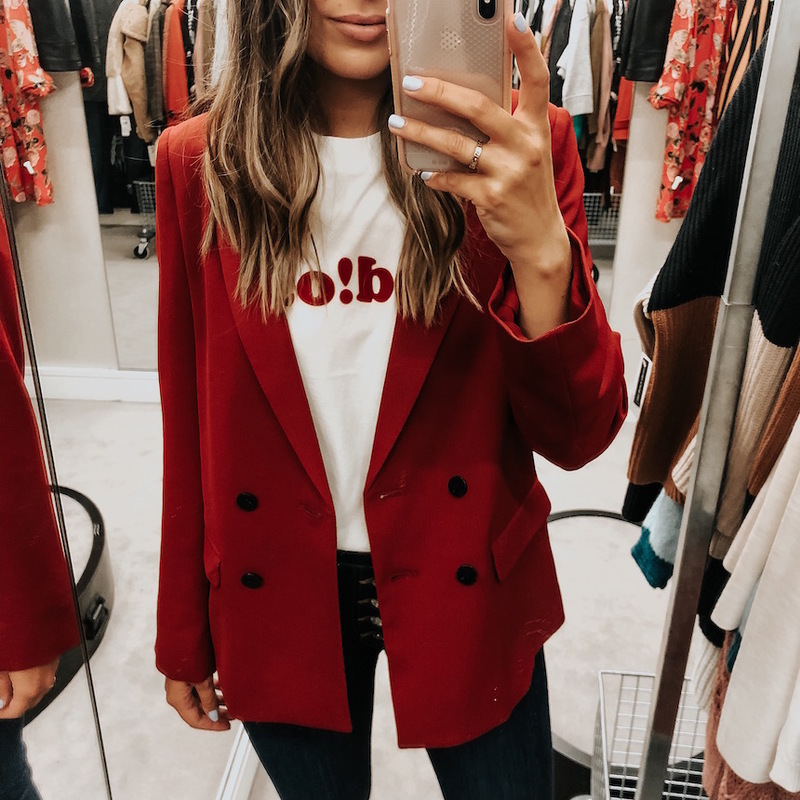 Adios tee (wearing a medium) under this blazer (wearing a 4) – love this look for fall with jeans! 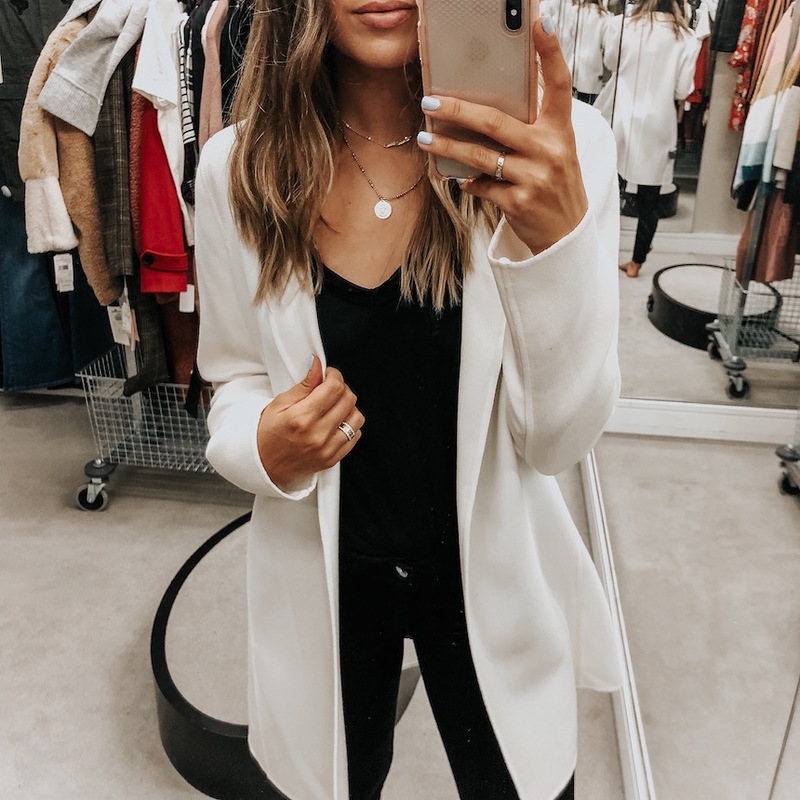 This is such a nice blazer for the price – feels so good on, lays nicely, and has a great fit! I’m going to get it in black also! 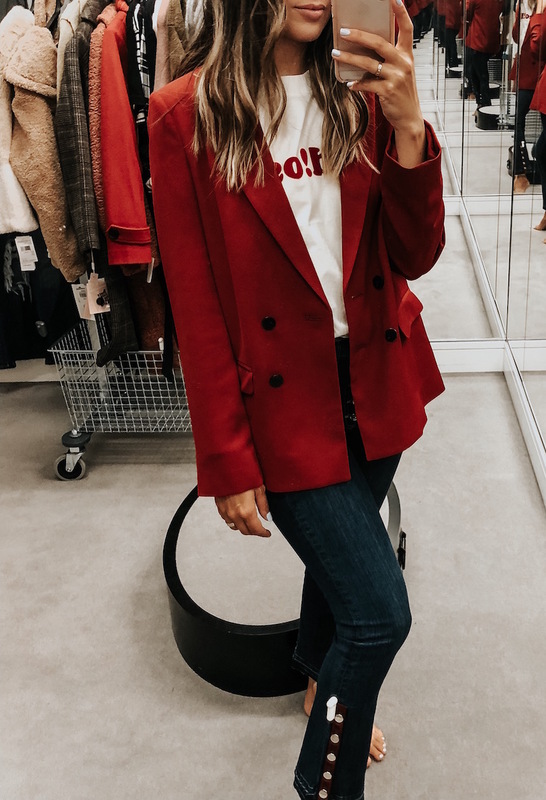 I ordered this blazer b/c my store didn’t have it. Love the menswear look – will be so cute over a band tee! This jacket is so pretty, and if I worked in an office I would splurge on it. It also comes in black – just loved the white! It’s so chic and you could wear it alllll the time! I’m wearing a small. 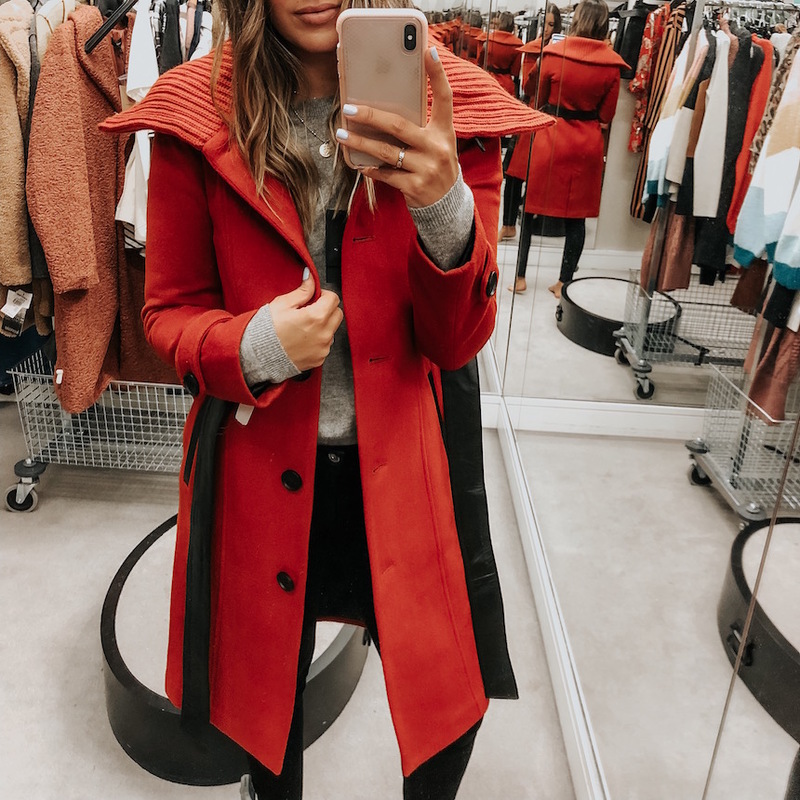 I love the collar on this coat, so pretty and the red + black combo is amazing! I’m wearing an xs. This leopard coat from Kate Spade is also an amazing statement coat. Really love this one! Another fun & different coat is this blue one from BCBG – dying over this color and the collar! 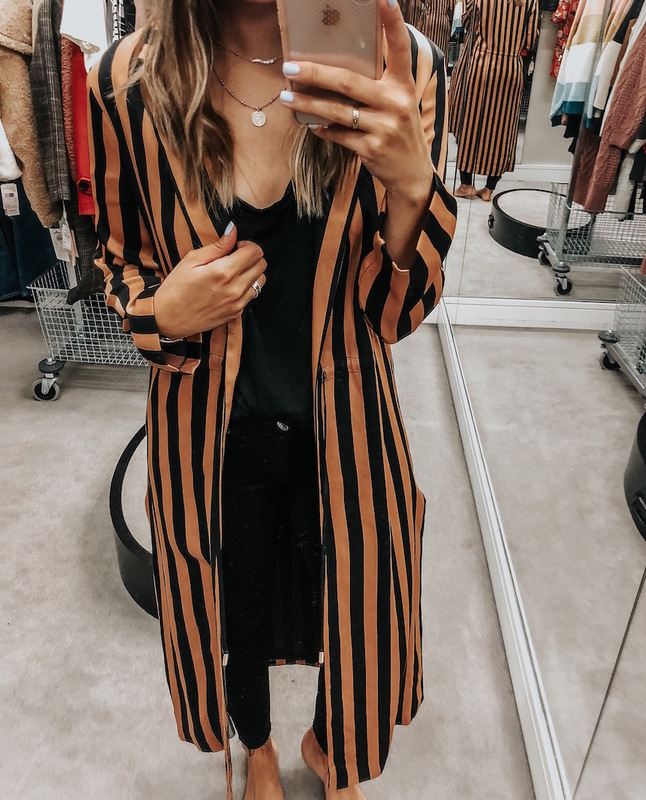 If you don’t have this coat yet, you need one! I love the oversized collar and teddybear look of this coat. If you like the profile, but not the fuzzyness, this is a beautiful, classic coat. LOVE! 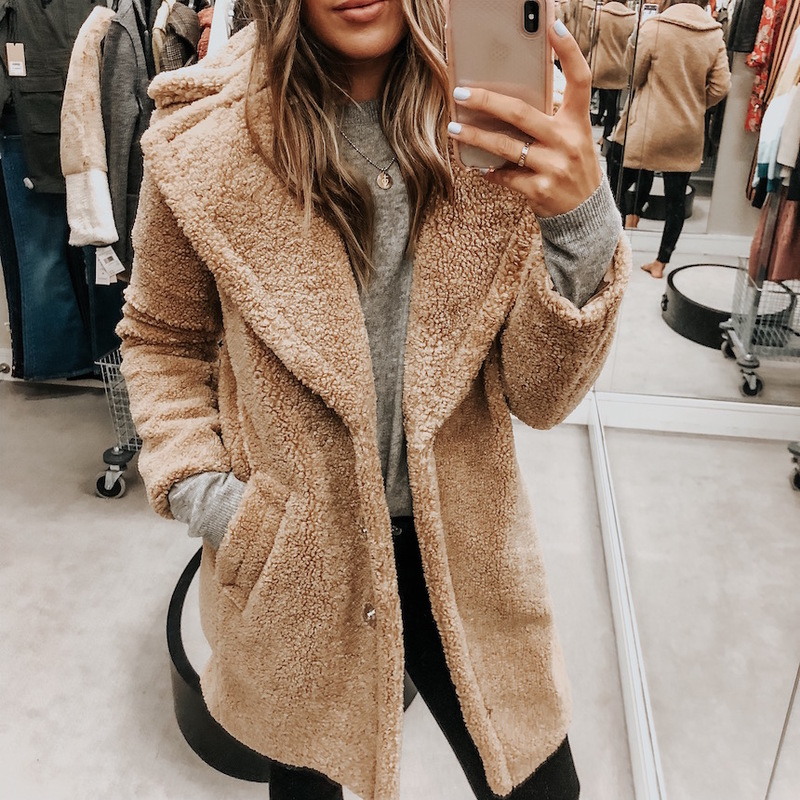 I just added this (faux) shearling jacketto my cart – gaaahh this is SO GOOD! I’m ordering a size xs and small just in case, I feel like this is going to sell out and I’m not sure what size to get. And with free shipping + returns I’m good to go! It says to order down, but I want to be able to layer. This camo jacket was fun with the embroidery on the sleeve, I’m in the XS. This one was my favorite, though. 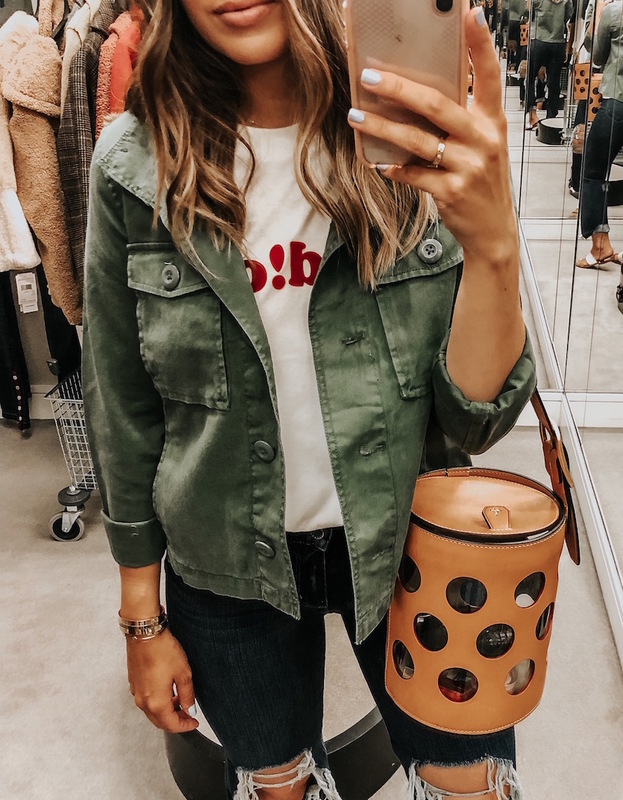 Love a classic green jacket – also wearing an XS in this one. These jeans are also a part of the sale – true to size. 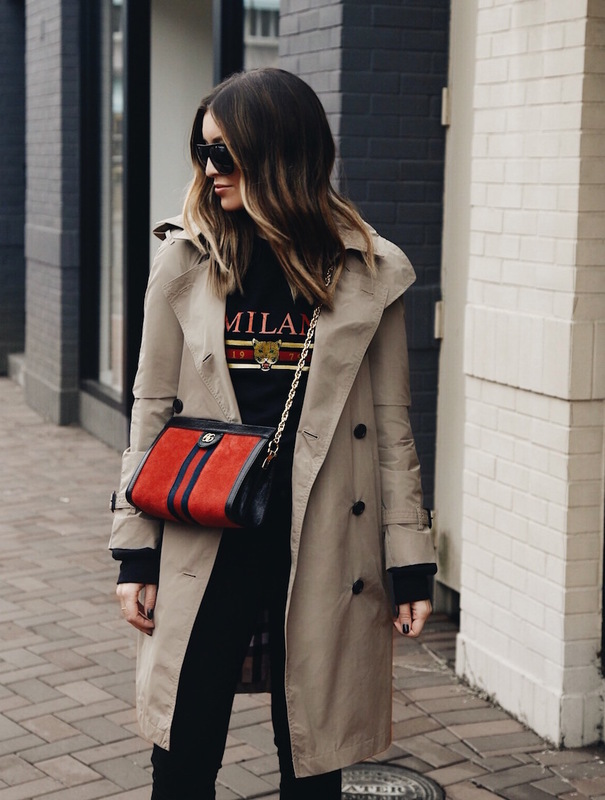 Just found the best dupe ever for my Burberry jacket, and it’s only $112! Seriously, identical! This camo hoodie is still a splurge, but I will wear it all the time – to the gym, school drop-off, errands, etc. Love the fit, pattern, and material! Done! This duster is so fun, especially if you’re an Iowa fan ;). Or any black/gold sports team! Love the silky feel and the length! I tried this sweater on last and was just over being in the fitting room lol! But it is so cute, I love the side buttons! I’m in a size 4. The sleeves on this sweatshirt are so fun, and I love the blush color. I’m wearing a size medium, but think I will get the small – this doesn’t look better oversized. Really pretty dress from Alice + Olivia! I have this dress in a different pattern/print and love it, the quality is amazing. I also realllly want this A+O sweater. Nothing can beat a classic pair of Hunters, and the best pair (black!) is part of the sale! Get these before they’re gone! We both have them and will never get rid of them. 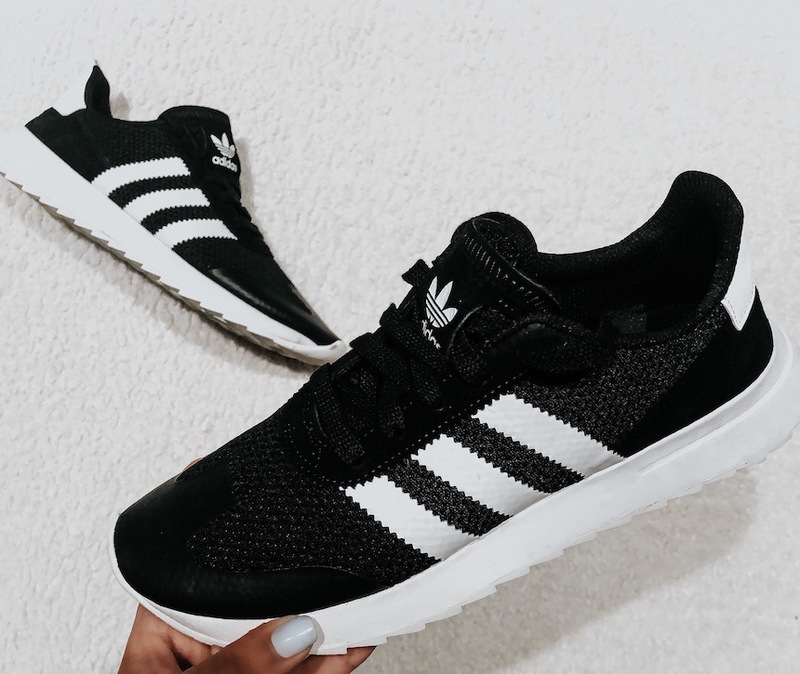 Sizes going quickly in these sneakers, so hurry if you want them! I went down 1/2 size. 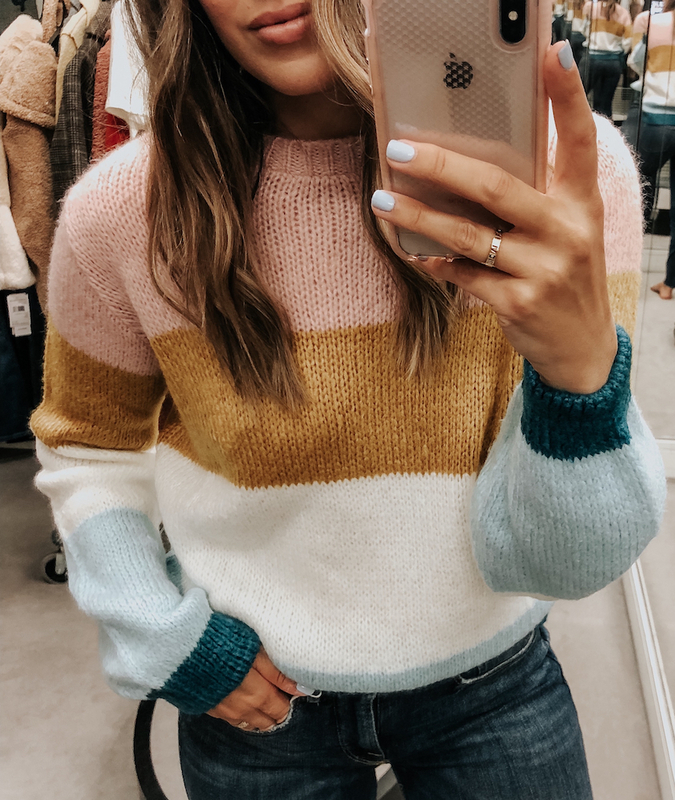 Your favorite grey cardigan link is linking to Topshop colorful pullover for me. Is that correct! 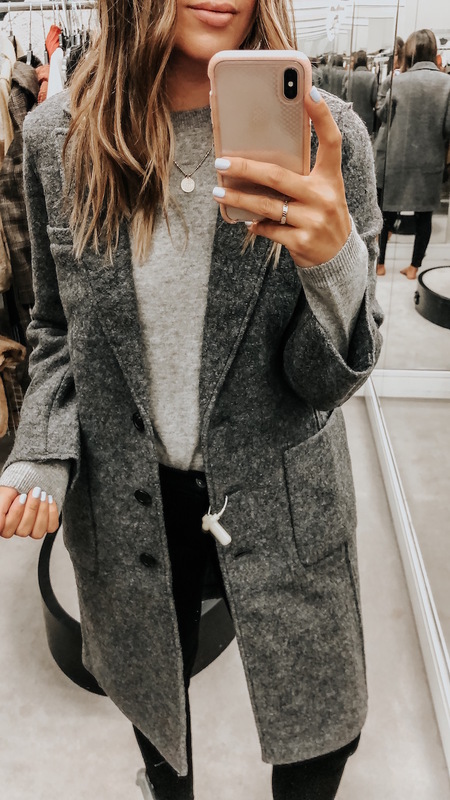 I would like to purchase the grey cardigan in the picture! This is a really great post! Thank you for sharing all your picks. I plan to buy several of these items. Just wondering, should I use the links from your post so that you get “credit”? I assumed those are unique links so that Nordstrom knows the sale came from a Somewhere Lately reader. I would have passed up lots of these items had I not seen them styled by you! Such a great round up! I was distracted by your gorgeous Roman numeral ring , I’ve been wanting a ring like that for awhile. Where is the ring from? 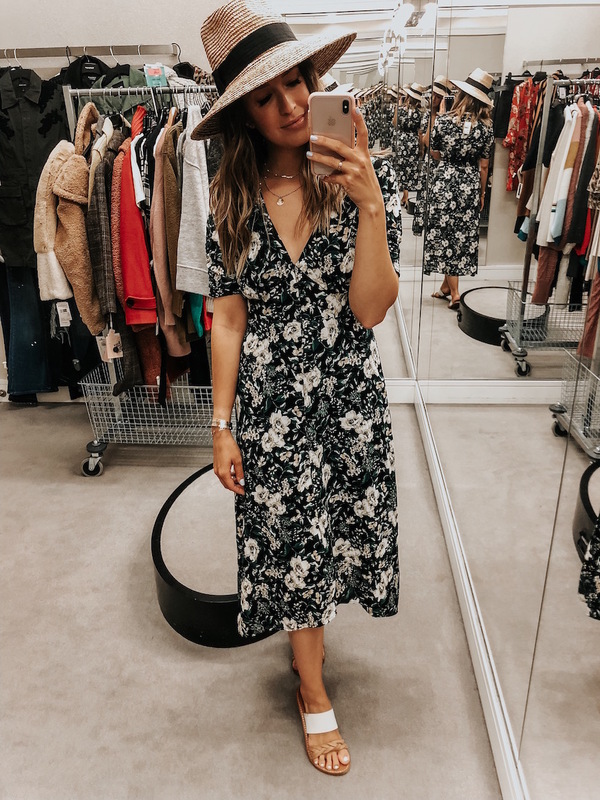 I loved how you shared pictures directly from the fitting room, I always prefer seeing how clothing pieces look on rather than just in the picture on the Website. You picked out some beautiful items! This is a great round up! Love all the pieces. I can’t get over your rings though! Can you post where your jewelry is from. Wow! Great picks Brooke! My only complaint is early access is for card holders. Hopefully, I can sang some good pieces once the sale opens to the public. Hi! Thanks for all of these picks! They are amazing! Is the necklace you are wearing from Nordstrom? Can you tell me more about it? Hi! Can you tell me where your round pendant necklace is from that you’re wearing in all of these pics? Love it! Thank you! Love all these! What are the necklaces you’re wearing in these pics? Why must you make everything g look so cute? Give me all the sweaters! In TX 😬 not necessary lol. But it’s happening!